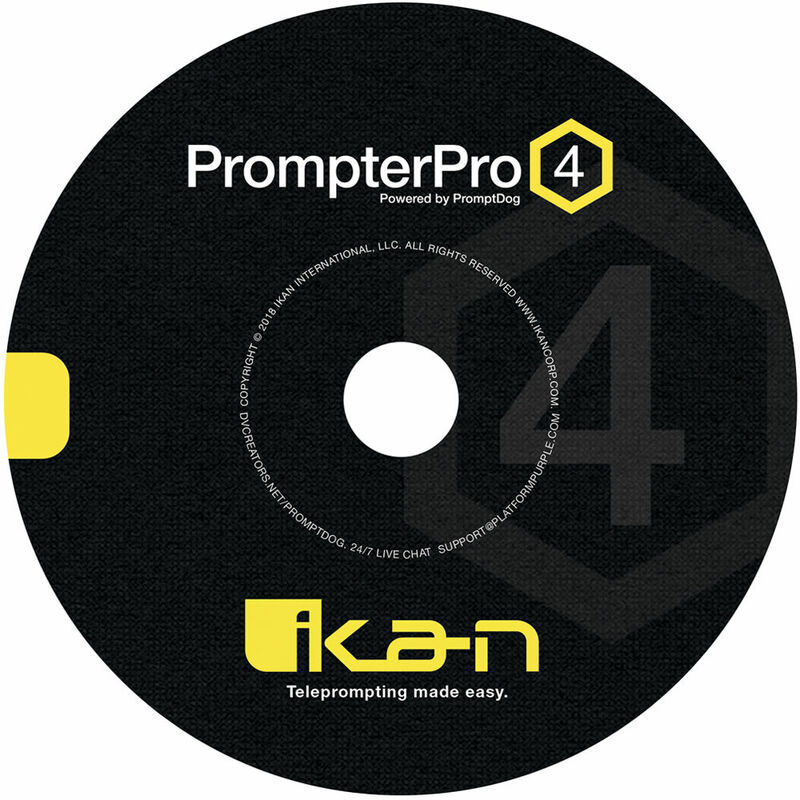 Details matter and ikan's PrompterPro 4 Teleprompting Software for PC and Mac attends to the details to help keep your on-air talent calm and collected. This item is an electronic download; it includes a full-featured text editor that supports international languages while prompting the text scrolls smoothly and avoiding disconcerting text bounce. The software also supports a second talent monitor, and an one-click text mirroring simplifies your display issues alleviating the need for a monitor that can mirror via hardware. Please note that with PrompterPro 4, text controls are available on the main page and not hidden away in a menu system. An adjustable eyeline indicator allows you to change your talent's reading position. A built-in timer system displays not only the elapsed time, but it can also display the estimated time remaining based on how the talent is reading it. If you should run into problems, live chat and email support is available through the manufacturer's website. When a separate teleprompter operator is running the prompter, as opposed to the talent, a second resizable window can be positioned on a second monitor with perfectly synchronized scrolling, so you can operate the prompter for your talent. Click-and-drag to reposition the eyeline indicator and the change is automatically mirrored in the second window. You can choose to have the eyeline indicator on the left, right, or both sides of the prompter window, and you can control the indicator's opaqueness. The controls for text size, font, line spacing, and inverting text for black-on-white display are easily accessible right on the main page. Not only there is a timer display that shows how long you've been reading, but a secondary timer displays the total estimated read time based on the length of the script and how fast the talent is reading through it. Quick search allows you to jump to a specific phrase within the text without scrolling. This is a great time saver when working with long scripts. This functionality is active in both the text edit and the operator windows. The text on the talent's window can be reversed, which is handy when working with a monitor that does not have hardware image flip. Text mirroring works with any font, accented characters, and even right-reading languages.